Have you tried polymer clay? I’m here to tell you that the stuff is addictive! I bought my very first package last week, and then proceeded to make just under 100 flowers for this artwork that I’ve wanted to make for well over a year now. The best thing about this artwork is that it cost me less than $10. It’s true! Then only thing I had to purchase was the polymer clay, which I believe was $8.99. (It would have cost less if I had taken a coupon with me!) I had everything else on hand already…spray paint, scrap wood, hot glue, etc. 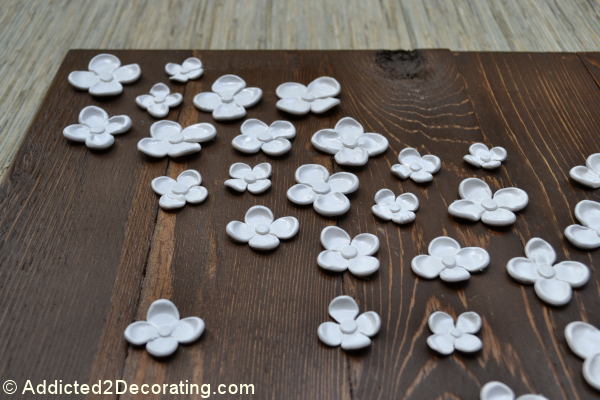 First, use the polymer clay to make all of the flowers. I used an entire 8 oz. package, and ended up with just under 100 flowers in three different sizes. Start out with three balls of clay that are about the size of peas. Flatten the ball of clay so that the clay forms a ridge around the top and sides of your finger. Use your finger to gently even out any harsh edges. Form the bottom of the circle of clay into a point, and gently lift up on the rounded edge to create a curved petal. Repeat this three more times, and then place four petals with the points together. 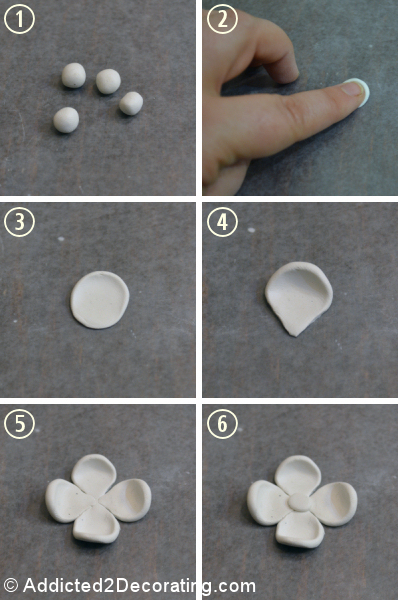 Drop a small ball of clay onto the center and flatten slightly. 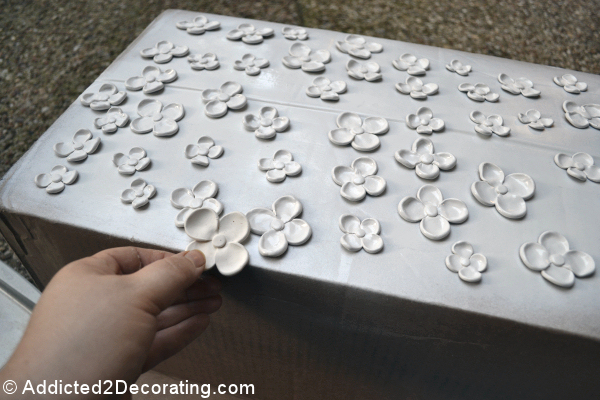 Then bake the clay flowers according to the instructions on the package. 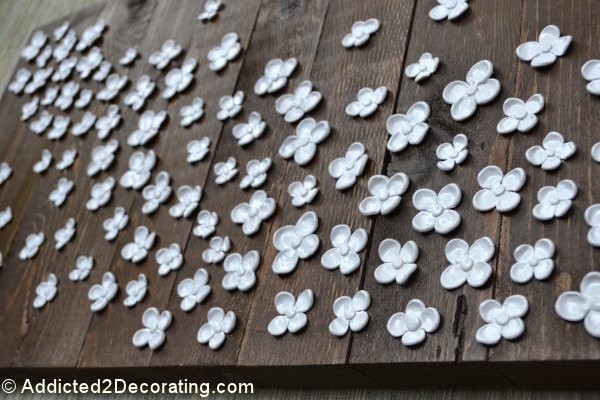 After the flowers are baked and have completely cooled, use a spray paint in your choice of color. This is optional, of course, since polymer clay comes in a variety of colors. However, I wanted mine to be a brilliant white, and as you can see below, the white polymer clay had a bit of an off-white color to it. 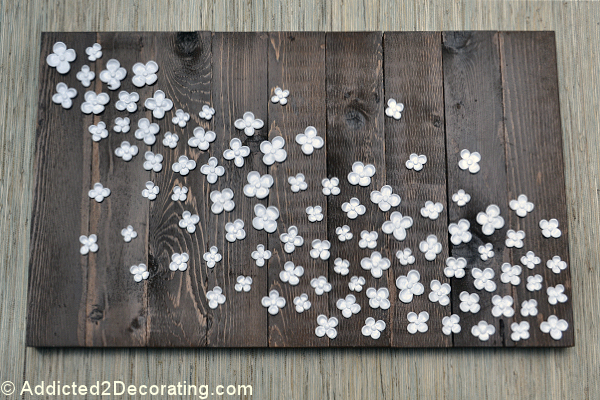 While the flowers are drying, prepare the wood “canvas”. I used scrap pieces of 2″ x 4″ cedar (left over from my elevated garden beds), and I cut them into pieces that were 20 inches long. 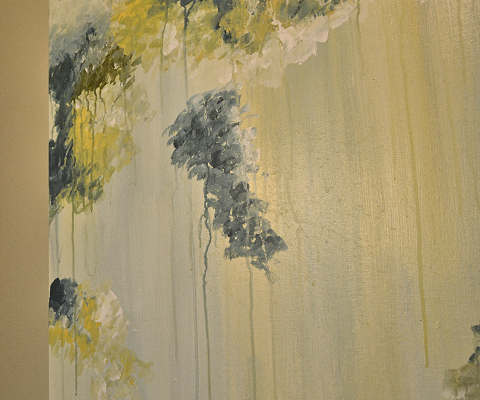 My “canvas” ended up being 20″ high by about 33″ wide. 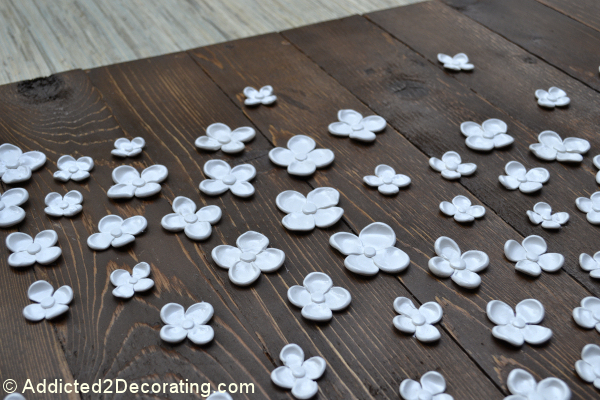 Glue the wood pieces together using wood glue (don’t use too much or it’ll run down and get on the front side of your “canvas”, which will affect how the wood takes stain). If you have a framing square, use it to be sure that the pieces are lined up straight. Then use thinner scraps of wood and wood glue to hold the pieces together. To make the piece really secure, follow up with wood screws, screwing them through the thin horizontal wood pieces into the main wood pieces. 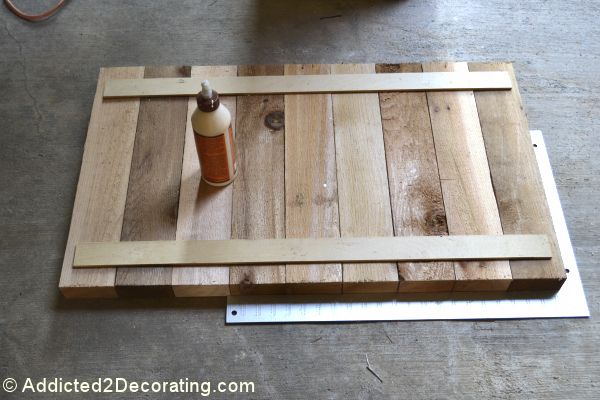 Note: If you have a Kreg jig, use that instead and you’ll end up with a much sturdier “canvas”. After the glue has dried, give the front of the “canvas” a quick sanding, and then stain and polyurethane the wood. 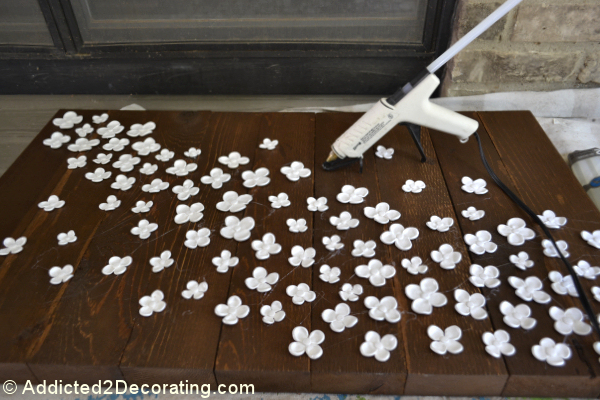 Once that’s dry, you’re ready to arrange and glue the flowers. And when you’re done, you’ve got a beautiful piece of dimensional artwork! 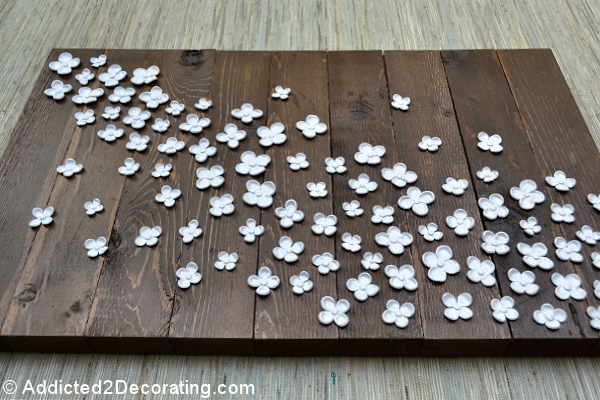 I really like the juxtaposition of the shiny white flowers against the rustic stained wood. When I make something like this, one of the most asked questions is how to hang it. Any time I’m hanging something heavy on the wall, I use a French cleat. You can find these at Home Depot and Lowe’s. They’re metal, they come with their own level, and they’re rated by the number of pounds they’ll hold. 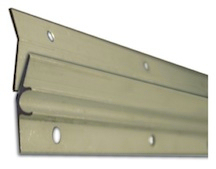 I use these to hang anything from heavy framed mirrors to even heavier upholstered headboards. 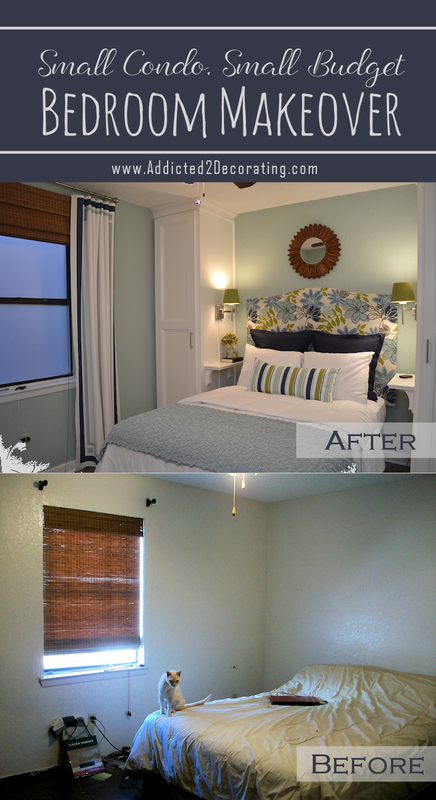 They’re absolutely the best way to hang heavy items! Thanks so much for sharing!! I can’t wait to try this! 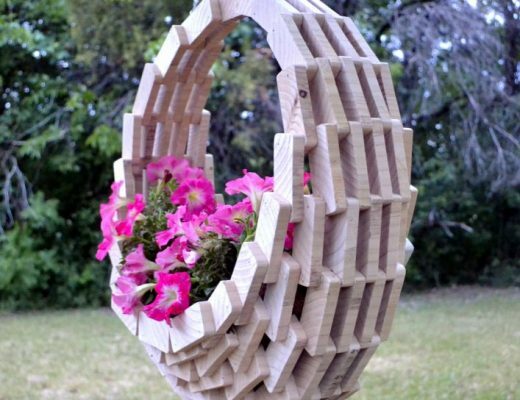 This rocks – reminds me of the 3-d art that’s all the rage now! Against the wood – even better. And I was worried when you said you were hanging it over your bed (thoughts of you being crushed in the night) but that french cleat is the perfect way to hang it (thanks for the tip). That is really pretty Kristi. 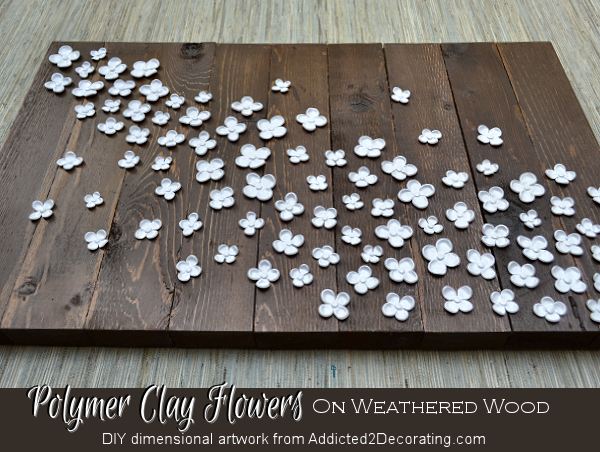 I like the brilliant, glossy white against the dark stained wood and the tiny, whimsical flowers are so delicate looking. The whole piece has a really clean aesthetic. It’s just beautiful!! Stunning. This is such a great idea and the flowers are so lovely. This is gorgeous. I have a few blogging friends that work with this, and they LOVE it too. I may have to try it sometime! I love it! The stain and the flowers look great together! Fabulous art!! You are an artist Kristi!! This is perfect for my daughter’s room! Wow! So pretty and so doable!!! I love it, it looks great!! Thanks so much for the awesome Tute!! I just want to say I just absolutely love your work!! You take such simple materials and create the most beautiful pieces. I can’t wait to start my pistachio flowers ;). 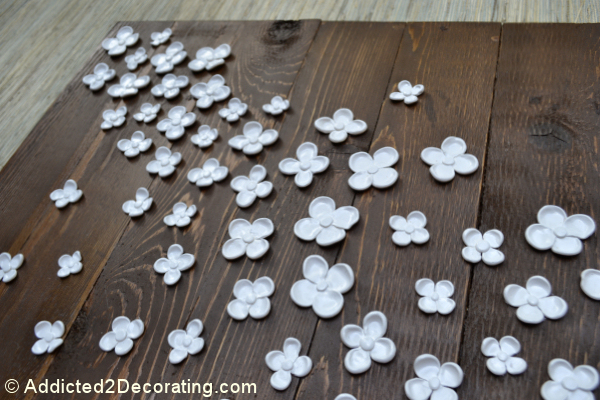 Quick question though, do you think you can make the flowers using a salt dough? I have never made it before, but I was planning to use it for some ornaments and wondered if i could knock some of these out with it. Now about the salt dough…it’s been years…DECADES even…since I used salt dough. I remember making ornaments out of it when I was a kid. But I don’t really remember the consistency. I’ve seen people make some pretty nice things with it, so I’m inclined to say that yes, it will work. At least it wouldn’t be expensive to try it out, right? Hope you’ll do that, and then report back! If it works, I might try to make something with it as well. The idea is amazing Kristi! !i jst luvd it!! Nd i em jst adding up a bit 2 it, em gonna drill holes in the place wer em gonna stick d flowers, as in in d middle, nd add christmas lighting 2 it, each small light through the hole, nd try 2 mke a hanging cieling lamp! !hopin it wrkz! !strtd it 2day, hope 2 finish it by monday! !thnx a lot for this B-E-A-utiful idea darling!! Hi there! I love love love this piece! It is so beautiful and I want to make one for my bedroom. The only concern I have is where I would find distressed wood like that. I live in the city and have had no luck on craigslist. Do you have any ideas of where I could get some or perhaps how to make distressed wood? Thanks! Oh! I’m doing this for sure! Thanks for the idea and inspiration! Very pretty. Brilliant idea. Love it.